As rain poured and floodwaters inched toward his house in south Houston, Wes Highfield set out on a risky mission in his Jeep Cherokee. He drove in several directions to reach a nearby creek to collect water samples, but each time he was turned back when water washed against his floorboard. “Yesterday as these large retention ponds filled up, eight feet deep in places, kids were swimming in them, and that’s not good,” said Highfield, a scientist at Texas A&M University’s Galveston campus. The Brio Refining toxic Superfund site, where ethylbenzene, chlorinated hydrocarbons and other chemical compounds were once pooled in pits before the Environmental Protection Agency removed them, sits “just up the road, and it drains into our watershed,” he said. Harris County, home to Houston, has at least a dozen federal Superfund sites, more than any county in Texas. On top of that, the state lists several other highly toxic sites managed by the Texas Commission on Environmental Quality. Up to 30 percent of the county is under water. Like other scientists in the area, Highfield is deeply worried about toxins leaking into the water during an unprecedented rainfall and flooding from Hurricane Harvey that caused dams to spill over for the first time in history. On Tuesday, ExxonMobil reported that two of its refineries east of Houston had been damaged in the flood and released pollutants. “I made a couple of phone calls to colleagues who said bottle up [samples], label them and we’ll run them all,” Highfield said. On Tuesday, EPA officials in Washington traveled to Houston to monitor environmental risks. On Monday, a spokesman for the Texas commission, Brian McGovern, wrote in an email that its workers “took steps to secure state sites in the projected path of Hurricane Harvey” by removing drums with chemical wastes and shutting down systems. McGovern said that “EPA has been coordinating with potentially responsible parties” that created the federal toxic sites to secure them. “The TCEQ and EPA will be inspecting sites in the affected areas once reentry is possible,” McGovern wrote. But Highfield and a colleague at Texas A&M;, Samuel Brody, want to know what’s in the water now, as residents with children sometimes plunge into it as they wade to safety from flooded homes. 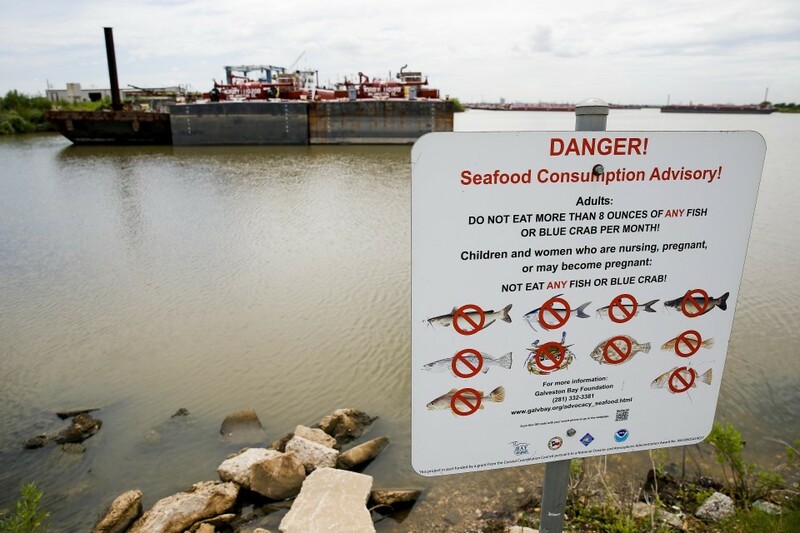 With its massive petroleum and chemical industry, Houston, part of the “Chemical Coast,” presents a huge challenge in a major flooding event, said Mathy Stanislaus, who oversaw the federal Superfund program throughout the Obama administration. The EPA tested Superfund sites after Hurricane Katrina in 2005 and found that contamination was relatively contained, said Nancy Loeb, director of the Environmental Advocacy Center at Northwestern University’s Pritzker School of Law. But she cautioned that other more risky sites lie in the path of any storm that strikes a major metropolitan area such as Houston. 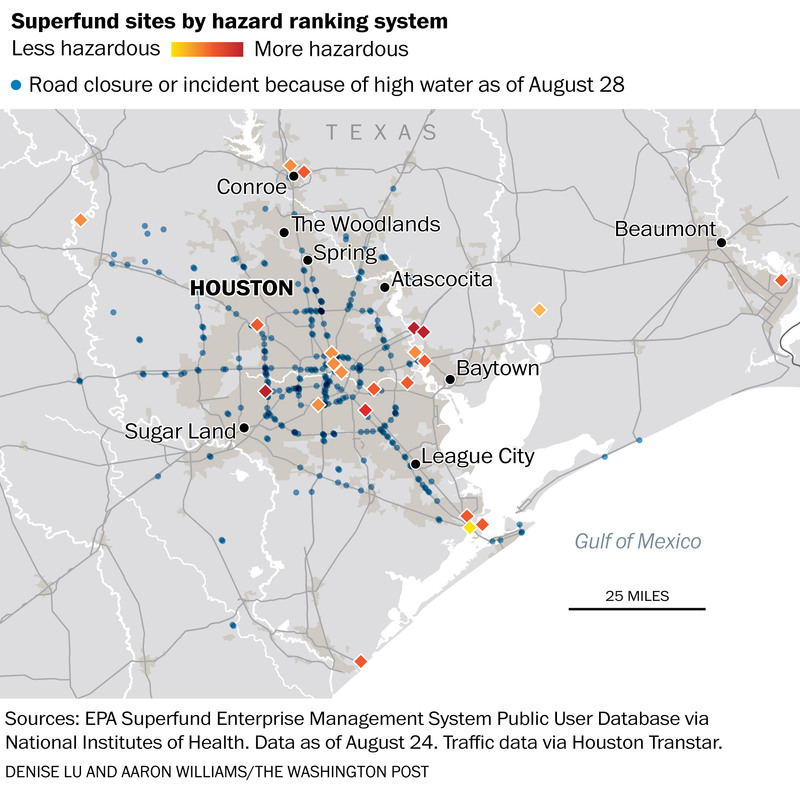 In addition to the toxic pits at the Brio in Houston’s Friendswood community, Harris County’s polluted Superfund sites include the low-lying San Jacinto River Waste Pits that “is subject to flooding from storm surges generated by both tropical storms (i.e. 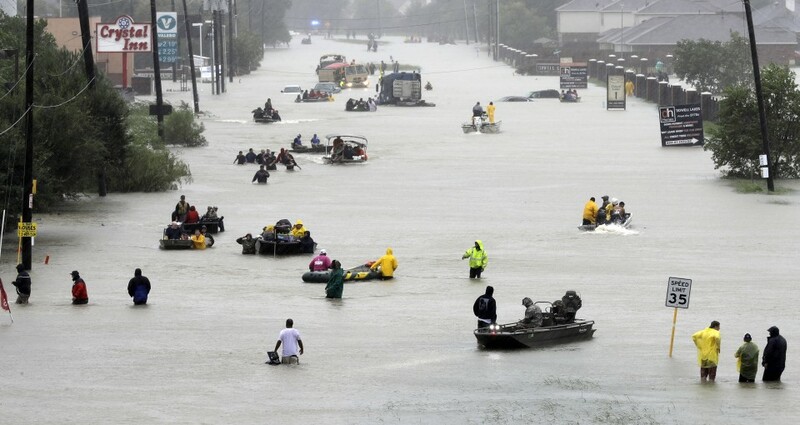 hurricanes) and extra tropical storms” that push water inward from Galveston Bay, according to an Army Corps of Engineers report released last year. There’s also the Many Diversified Interests site near the heart of the city, the Crystal Chemical Co. site in southwest Houston, the Patrick Bayou site off the Houston Ship Channel, and the Jones Road Plume dry cleaning waste site. They include oily sludge and contaminants dangerous to inhale or touch: perchloroethylene, trichloroethylene and chlorinated hydrocarbons, to name a few. Highfield became alarmed Saturday when he saw teenagers swimming near a football field where water had risen to the crossbar of the goal post. He mentioned what he saw to Brody and recalled that they both reacted with worry. “I’ve been thinking a lot about this,” Brody said, so much so that the professor instructed a graduate student to analyze the distance between toxic release inventory areas such as Superfund sites and dry cleaners that store chemicals to 100-year and 500-year floodplains where housing and business developments sit. According to the analysis, the average distance between the facilities to a 100-year floodplain in Harris County was 44 feet, compared with more than 2,000 feet in nearby Galveston and Chambers counties. The average distance to a 500-year floodplain in Harris County was about 70 feet, compared with more than 3,700 feet in Galveston County and 2,300 feet in Chambers County. Both Brody and Highfield said Monday that they were fortunate: Water had not entered their houses. A month ago, Brody packed his family of four and moved from the Friendswood section of Houston that’s now being devastated by the flood, leaving his friend Highfield there. Brody specifically searched for a house on higher ground and is confident that water won’t enter it. Highfield is less sure as the flood creeps toward his driveway. All around him, houses and cars are underwater. It fuels his concern about what might enter his house with the water, and what his neighbors and their children encounter when they frolic in the water. But it was no use. His car was no match for what is by far the worst flooding ever in a city that has flooded since the month it was first founded. “I need it to stop raining. And I need things to drain a little bit,” Highfield said. Scott Pruitt vows to speed the nation’s Superfund cleanups. Communities wonder how.